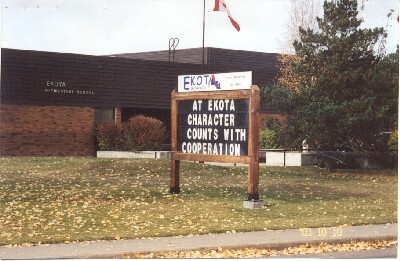 Ekota is the Cree word for "the place to be." We believe that with the shared commitment of students, parents, and staff we create a safe and caring professional learning community in which every student achieves superb results. Contact Ekota School office at 780 462 5112 to set up an individual visit to our school and our Kindergarten classroom. We look forward to your visit! We are an elementary school . . .
We are a facility that offers . . .
We are committed to . . .
We are supported by . . .
We value ongoing communication with . . .
We celebrate student growth and achievement with . . .
that with the shared commitment of students, parents, and staff we create a safe and caring learning community in which every student achieves academic success.